Although it’s not the best color combination for me I’m always attracted to the classic black and white look. Certainly when that combination is worn with a bit of an edge with comtemporary jewelry and elements of draping and asymmetry. I’m therefore very attracted to Deborah’s unique minimalistic style. Let’s find out a bit more about her and why she mostly sticks to this color palette. I am a Melbourne girl, now living in the largest regional centre in the state of Victoria, Australia. My career has been varied with social justice/social inclusion and style being my two main passions. I am grateful to be able to work between the two. Happy to share, I am 48. Can you tell us a bit more about your blog Stylish Murmurs and why you created it? 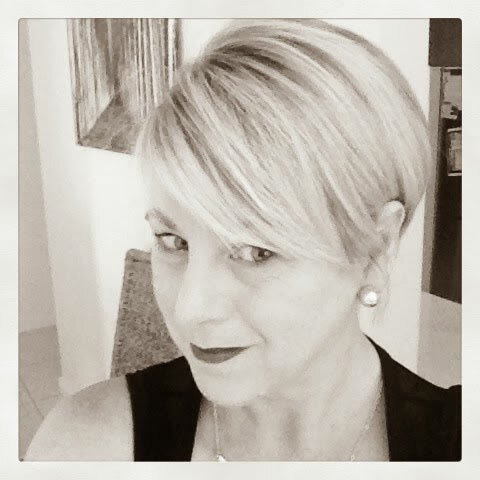 I am an avid blog reader, and just over 12 months ago I decided to start my own blog. Stylish Murmurs was born out of a desire to document my style evolution and connect with like minded women. I think my style could be described as minimal. I prefer a neutral colour palette and garments that drape and have interesting, but subtle, design features mixed with more structured items. You stick to a mainly black and white palette in your dressing. Why is that? And white tends to flatter and light my complexion. White is my ‘colour’. When I don’t feel like an “all black” outfit, I turn to white to accent the black. I live in regional city and I would say technically where I live has little to do with my style choices. However, relocating to a city where we knew no-one, freed me from any preconceived ideas I, and others, may have had about my personal style. I felt free from the expectations of others, and myself, to really start exploring exactly what felt “like me” and started dressing for myself. I do feel I have a signature style. The consistent elements of my style would be black, my blonde hair (which I recently chopped) and red lips. I consider a number of things. What I am doing that day, weather, will I be on my feet etc. Mostly practical things, but I am a bit of a mood dresser too, so how I ‘feel’ also comes into play. I definitely take body type into account. I am a petite ‘apple’. I have a tummy… and a large bust. Figure flattery is a priority and I choose garments that visually elongate my legs, hide my tummy and reduce my bust. But there are some days where conventional figure flattery goes out the window and I wear something simply because I like it. I feel any style changes I have experienced have been more related to knowing myself better and being more fully at peace with myself. So that does tend to come with age but I don’t think it is directly related to turning 40. Having said that, and at the risk of sounding clichéd, I did find turning 40 quite liberating. I am in a place where I like what I wear and I don’t mind if others don’t. I have read and participated in many ‘age appropriate’ discussions, and I am still not sure what it really means. It is quite subjective and I think it means different things to different people. I think we should dress in what we believe is ‘appropriate’ for us. Sylvia, I am almost ashamed to admit that I am a little (ok, alot) obsessed with style. I have always loved fashion but my perspective is slightly different now. For me style is more important than fashion. A woman doesn’t have to be fashionable to be stylish. It’s difficult to pick favourites, but I would say that my more recent outfits would be my favoured ones. When I started my blog I was coming out of a period of experimenting with colours, trends, etc, whereas I feel I have now much more in touch with what not only works for me but what feels like me. I do like to keep up with what is happening trend wise, but my wardrobe is not trend driven. For me to include a trend item in my wardrobe it has to meld with my personal style aesthetic. At the moment, I am excited by the amount of fluid silhouettes that we are seeing. I don’t have any specific tips. I would like to encourage women to simply be who they are. How we dress ourselves can be a wonderful creative expression. Enjoy getting dressed, have fun with style and don’t allow anyone to make you feel you should dress or look a certain way. Be authentic to yourself. Well I am a bit of a lazy blogger, posting only fortnightly. I would like to post more frequently. I hope the blog will somehow be a reflection of my growth, both stylewise and personally, but what that looks like, we will have to wait and see. I love Deborah’s unique style and especially love her new haircut! Be sure to check out her blog Stylish Murmurs and check out all her outfits! The first, of course. So elegant! # six, where she is holding her glasses. First, I’m in love with your gray cascading vest. Great interview. Thank you for you advice to be authentic to ourselves. Very nice interview. Beautiful woman with her own, very definite style. I really enjoyed this interview! We all need to be authentic to ourselves – in so many ways, live authentic life, then the style will be a true reflection of who we are. Everything else, I feel, is quite secondary. Thank you for the interview! Very nice interview Sylvia! Since I wear a lot of black (it’s a given living in NYC), I enjoyed seeing Deborah’s outfits and would wear just about any of them (although our body types are pretty different). Her advice on having fun with fashion and seeking out style over fashion is on target with the great advice you have given us. Thanks for introducing Deborah’s blog to your readers. Great Interview And Great Style Tips. Particularly Like Both Black And White Jackets. 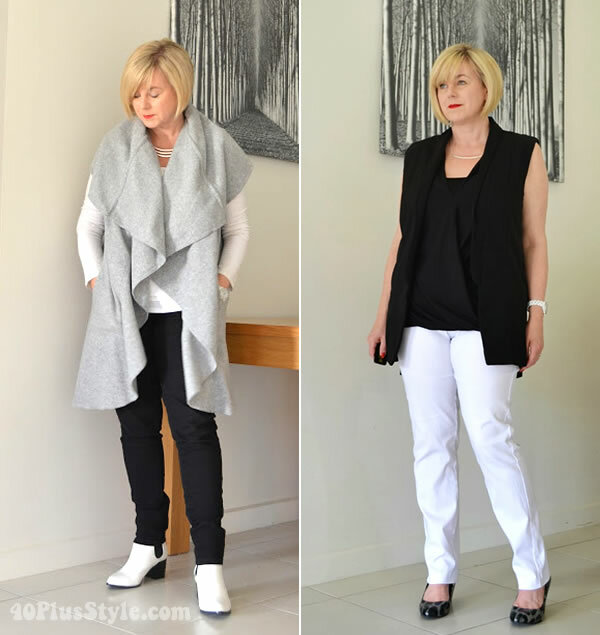 Deborah is one of my personal favorites in the 40+ bloggers! She wears black and white with such grace and dignity. I adore her new haircut and always enjoy her posts. I can see she truly was a passion for fashion because her comments on my blog are so insightful. I enjoy reading this article and learning more about this interesting woman. I think she wears black and white in a way that enhances the design of each item she wears. She looks great in all her outfits. Love her style. Great interview and love the different bloggers you have interviewed recently. I love that they are so different. 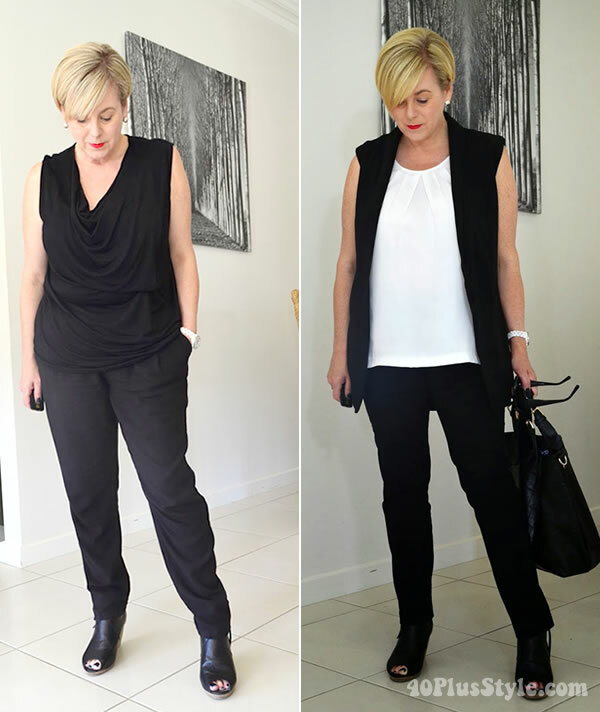 Love Deborah’s style – she seems very defined in what fits her best. I like her style! she is so elegant. 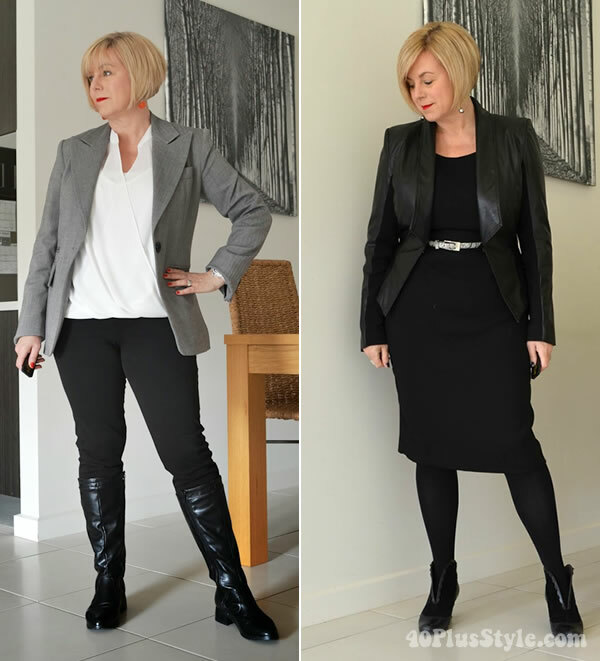 Deborah is a fantastic example that having a signature style doesn’t mean boring looks. She is perfect in adding this great red colour dash to many of her outfits and also her jewellery is very unique. I love her zebra jacket! I really enjoyed the interview too. Deborah’s comments about her emotional response to black and how it conveys her message about mystery, quietness, intelligence, formality, and simplicity intrigued me. Colour in fashion is fascinating. I am drawn to yellow and yellowy/greens, petrol blues and fushia and orange combinations. I love informality, cheerfulness, ideas, stimulation and exchange. I never thought that the colours I choose might be giving out messages about how I am. I loathe wearing black too, but really get how Deborah uses it and agree with the message it sends. It would be interesting to hear more about her experiments with colour. I love all of your style profiles. It’s so nice to be introduced to other stylish women and blogs that I didn’t know about before. Great interview and a very unique style. I could see where having a closet consisting of only black and white would mean that combinations would be endless. Not something I could ever personally do since my obsession is colour but it is fascinating to see someone else dressing themselves like this. Fabulous interview about a very stylish lady! I thoroughly enjoy Deborah’s Blog ‘Stylish Murmurs’ too. I thought I had already commented on this post, but no… So here we go. Deborah has got a very good eye for what suits her and an unique style. I like almost anything she shows, been to her blog a couple of times (sorry Deborah, should have been there more often). It is strange that when she is in summer I am in winter and vice versa. Then again, you (Sylvia) are always in summer. I like how she varies with black and white, always very contemporary with her jewellery. Often with colourful earrings. And she also seems a nice person. Very elegant, beautiful clothes and a great hair cut! I think she looks fab in very outfit especially the peplum! I admire Deborah’s style, especially the consistency, which I think is key. Glad to see her featured! Previous post: The red skirt and mustard top and my key elements of style. Do you know what they are for you? Next post: Which skincare products are right for you? This is what I use.